East side of Euclid Street, south of Acacia Parkway at 12900 Euclid Street. SteelCraft is a food-focused multi-tenant project, which includes the construction of a 9,532 square foot building consisting primarily of recycled and re-purposed metal shipping containers, along with other associated site improvements. 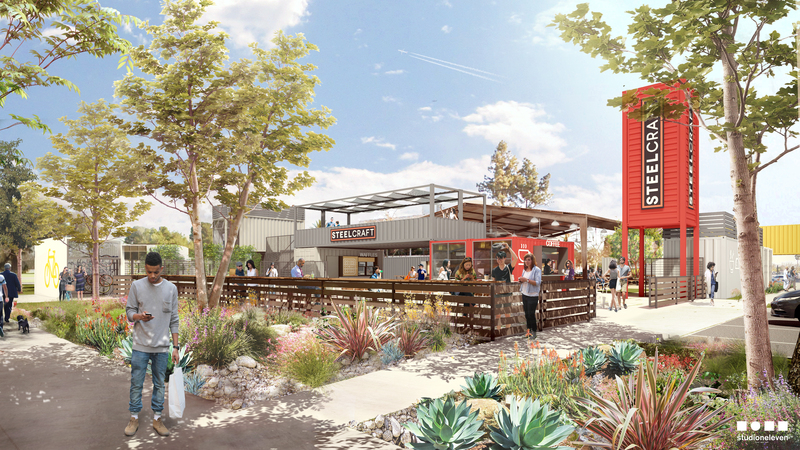 SteelCraft will be an outdoor urban eatery providing space for various local artisan food vendors, and will also include outdoor communal dining areas and live entertainment. South side of Garden Grove Boulevard, east of Euclid Street, at 11222 Garden Grove Boulevard. The Centre is a 16-unit project with two work-live units facing Garden Grove Boulevard and 14 residential units along a central drive aisle. The project met the requirements of the CC-3 Zone and the intent of the General Plan by adding to the compact development pattern of Downtown and providing residences within walking distance to Main Street, theaters, Steelcraft, Cottage Industries, and area parks. The project was approved for a Site Plan to build 16 units on a 28,232 sq. ft. lot, a Conditional Use Permit for 2 work-live units with tandem format parking, and a Tentative Tract Map to consolidate the site into a single parcel with condominiums. West side of Buaro Street, south of Chapman Avenue, between Jentges Avenue and Twintree Avenue, at 12111 Buaro Street. The City approved a Site Plan to construct 17 attached townhouses in two (2) new buildings consisting of one eight-plex and one nine-plex. The City also approved a General Plan amendment to change the Land Use designation from Civic/Institutional to Medium Density Residential to allow the development of the project. Two setback variances were also requested, one for the separation of habitable space from the drive aisle (10'-0" required, 5' 0" provided) and the second for the separation of a unit from the active recreation areas (5'-0" required, 3'-0" provided). A tentative tract map to subdivide the property into a single parcel with condominiums was also approved with the request. South side of Garden Grove Boulevard, west of Brookhurst Street at 10080 Garden Grove Boulevard and the adjacent property to the south at 9860 Larson Avenue (GGBGC). The applicant received entitlement approval to repurpose an existing 8-story, unfinished, steel structure into a 394 unit affordable senior housing project with 12,938 square feet of commercial retail space by amending the General Plan land use designations from Residential/Commercial Mixed Use 1 (prior Galleria, “Project” site) and Parks/Open Space (2-acre portion of Garden Grove Boys & Girls Club) to Community Residential to increase the residential density from 42 dwelling units per acre to 60 dwelling units per acre specifically for senior housing; to rezone the site from Garden Grove Boulevard Mixed Use 1 (GGMU1) and Open Space (O-S) to Planned Unit Development (PUD) to implement the new General Plan designation and the unique mix of uses; and Site Plan review for the proposed senior housing and commercial project, which includes changes to the massing of the building and an increase in developable site area to 5.09 acres from 3.09 acres. The developer also received approval for a density bonus of 35% under the State Density Bonus allowance and three concessions: a reduction in unit size from minimum requirements; a reduction in the required overall open space; and an increase in the number of allowable compact spaces. Project is in plan check. Northwest corner of Lewis Street and Garden Grove Boulevard, at 12901 Lewis Street. A gated small lot subdivision with 70 single-family detached residential units and related street and open space improvements on a 9.01-acre site. A portion of the project site was located within the City of Orange, which necessitated the approval of a reorganization of the city boundaries between the Cities of Garden Grove and Orange, which resulted in the detachment and annexation of approximately 0.901 acres from the City of Orange to the City of Garden Grove. The project was designed to satisfy all requirements of the City's Small Lot Subdivision Ordinance.